The Depression Sessions Preview Show! I’m all kinds of giddy. Are you? Our Depression Sessions pre-launch festivities officially kick off next Monday morning. That’s when I start posting early bird, full-length sessions along with those fancy buttons for downloading the videos, audio files, and transcripts (for FREE!). I’m still undecided on which early bird sessions I’ll be posting, but voting is well underway on the Facebook page. On today’s episode of the podcast, my special guest is none other than … me! * Dr. Datis Kharrazian on how blood sugar and insulin surges can send your serotonin production (and mood) way off the rails. 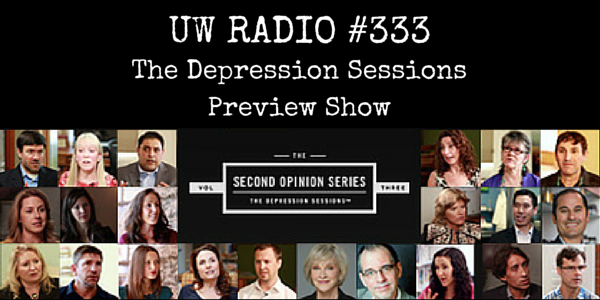 * Dr. Kelly Brogan uncovers what the unpublished data on antidepressants really says. THIS is cuh-razy! * Nora Gedgaudas discusses how she rewired her once-depressed brain with neurofeedback. * Dr. Dan Kalish reveals why people who take antidepressants are MORE likely to relapse than those who don’t take them. * Dr. Hyla Cass responds to the shocking statistic showing that 23% of women over the age of 40 are on an antidepressant! Can you say “hormonal link”? You’ll also hear from our friends Alisa Vitti, Trudy Scott, Dr. Jillian Teta, Gerald Roliz, Dr. Ben Lynch, Tom Malterre, Marc David, and Dr. Ann Childers. By the way, we’re having almost-daily LIVE Q&A video sessions with our Depression presenters during the official event weeks — June 14th thru 27th. Stay tuned for more info! As a loyal subscriber, you’re already signed up for our big event. But if you want to get you hands on your FREE Depression Jumpstart Video Series, click the link below and sign up. Insomnia, Brain Fog, and The Depression Connection. Is Your Low-Fat Diet Making You Depressed & Anxious? This entry was posted on Tuesday, June 2nd, 2015 at 10:37 am and is filed under podcast, wellness. You can follow any responses to this entry through the RSS 2.0 feed.